Diesen Artickel einschätzen What Solitaire games should you play for Christmas? Here are 4 games that you might want to think about. Take a look at the days - daytime is suddenly shorter, and the nights are starting to get long. You know what that means. It means that it’s almost Christmas time! Because the holidays are fast approaching, you would want to think about getting into the mood. You could start decorating your home, as it’s only a little over a month before Christmas. When playing games, you might want to think about which games you can play for Christmas, or simply just to feel the atmosphere in the days before the holidays come. Solitaire games should definitely be on top of your list! These games are now very different from what they used to be. While the main mechanic is still there, developers nowadays have come up with different ways to create a Solitaire game that’s unique on its own while still building up on the basic concepts of the classic game. Looking for challenges and the perfect Christmas vibe? 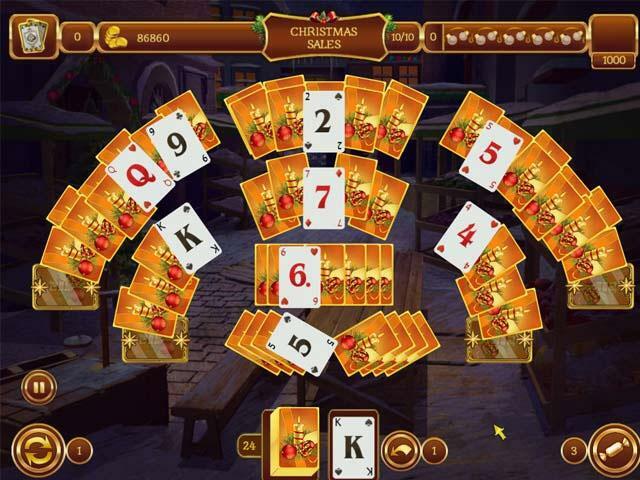 Go ahead to Big Fish and download Solitaire Christmas Match 2 Cards. This isn’t totally free, but you do have an hour to try the game, and find out for yourself why you should be adding this to your Big Fish library. Rack up hours upon hours of gameplay, with the game’s more than 120 levels available. You could challenge yourself more by taking a look at the achievements section and take a shot at getting all 20 trophies that are waiting for you. Central to the game, of course, is its unique gameplay. The cards used are Solitaire cards, but the gameplay is more similar to Mahjong where you pair up tiles to send them to the trash bin. Thus, with a very simple gameplay, you’ll be reveling in a totally fast-paced gameplay that should get your mind working. Another game you should add to your library for Christmas is Solitaire Game: Christmas. The moment you begin playing this game, you’ll see right away that the spirit of Christmas has always been in the developers’ minds when designing the game. Name another game that gives you three power-ups for free, right at the start of the game? There’s none other but this. The biggest challenge in this game is to achieve a streak - that is, you must be able to remove cards in quick succession so you can accumulate a very high score thanks to the multiplier that is triggered when you initiate a streak. Why should you aim for that? It’s simple - the score you get determines how much in-game cash you receive, and in-game cash is necessary for purchasing power ups once your free ones run out. Just like Solitaire Christmas Match 2 Cards, Solitaire Game: Christmas is available for a 60-minute free trial via the Big Fish Game Manager app. You’ll have to purchase it if you like it, but you won’t go wrong buying the full version of the game. Join Jack Frost and his companion as they set off on an exciting winter adventure in Solitaire Jack Frost: Winter Adventures. Enjoy collecting beautiful themed cards in quick succession to earn a ton of in-game cash. You can then spend your accumulated cash on buying Mulligans, Jokers and Shuffle power ups just so you could keep those combos coming! Sounds like the sort of fun you'd like this holiday season? Well, do check out the demo of the game and if you liked it, you may want to consider buying it as a Christmas gift for yourself or for a dear friend. What's better to play during the Christmas season than a game that has a jolly Santa as its main character? In Santa's Christmas Solitaire, you'll get to enjoy solving a huge variety of challenging solitaire with Santa for company. The game even features a ton of tricky, brain-teasing puzzles as well as hidden object scenes for you to enjoy if you want to take a break from solitaire. Being a collector's edition, you'll also get some nice Christmas-themed card backs and cursors to play the game with. Of course, like all Big Fish games, you can try the game out first before deciding to buy it, but if you do decide to purchase the game, know that it'll be completely worth it! Maybe you might even want to share this amazing game with your friends by buying it for them for Christmas!